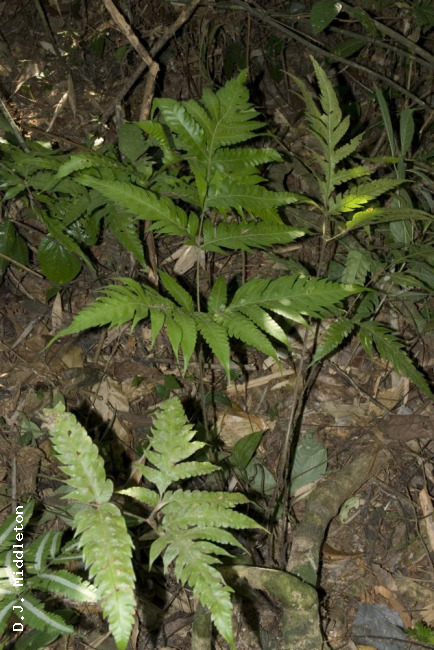 Tectaria griffithii (Baker) C.Chr., Index Filic. Suppl. 3: 180. 1934; Tardieu & C.Chr., Fl. Indo-Chine 7(2): 411. 1941; Holttum, Dansk Bot. Ark. 23: 240. 1965; Holttum, Rev. Fl. Malaya, ed. 2, 2: 636. 1968; Tagawa & K.Iwats., SouthE. Asian Stud. 5: 97. 1967; Tagawa & K.Iwats., Acta Phytotax. Geobot. 23: 55. 1968; Tagawa & K.Iwats., Fl. Thailand 3: 370. 1988; Holttum, Fl. Males., Ser. II, Pterid. 2: 54. 1991; Boonkerd & Pollawatn, Pterid. Thailand: 213. 2000. – Nephrodium griffithii Baker in Hook. & Baker, Syn. Fil. : 300. 1867. – Type: Griffith s.n., Burma (K). Nephrodium multicaudatum C.B.Clarke, Trans. Linn. Soc. II. 1: 540, t. 77. 1880. – Tectaria multicaudata (C.B.Clarke) Ching, Sinensia 2: 20. 1931; Holttum, Rev. Fl. Malaya ed. 1, 2: 507, f. 299. 1955 [‘1954’]. – Aspidium multicaudatum (C.B.Clarke) Bedd., Handb. Ferns Brit. India: 222. 1883. Rhizome short, erect, scaly; scales linear-subtriangular, up to 20 by 3 mm, entire, dark brown. Stipes dark brown to castaneous, up to 70 cm long, scaly throughout but scales gradually sparse upwards, hairy at least on adaxial surface. Laminae oblong-subdeltoid or pentagonal, up to 70 by 40 cm; lateral pinnae 1–4 free pairs, basal pinna the largest, with long stalk, asymmetrically subdeltoid, acute at apex, up to 30 by 25 cm, 1 or 2 basal basiscopic pinnules much larger, free with short stalks or sessile, oblong-lanceolate, caudate-acuminate, deeply lobed, up to 20 by 6 cm, 1 or 2 basal acroscopic pinnules free; middle pinnae smaller, with 0–2 free pinnules; apical pinna oblong-subdeltoid, acute at apex, broadly cuneate and a little decurrent at base, deeply lobed to pinnatifid; herbaceous, dark green, glabrous on both surfaces; rachis, costae and costules coarsely hairy above, sparsely scaly beneath; veins anastomosing to form copious areoles. 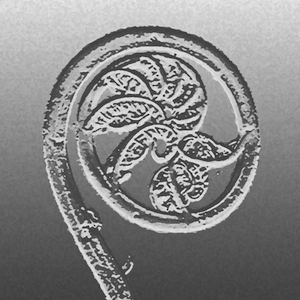 Sori round, terminal on short free included veinlets, indusiate, in a single row at each side of midrib, medial or a little costular, more or less immersed and raised on upper surface; indusia large, up to 2 mm diam., glabrous, persistent . NORTHERN: Lampang; NORTH-EASTERN: Loei; SOUTH-WESTERN: Kanchanaburi, Phetchaburi; SOUTH-EASTERN: Chanthaburi, Trat; PENINSULAR: Ranong, Surat Thani, Phangnga, Krabi, Nakhon Si Thammarat, Yala. N India, Burma, SW China, Indochina, W Malesia to the Philippines. On rocky mountain slopes in dense evergreen forests at low altitudes below 600 m alt. Least Concern (LC). This species is common and widespread and not under any known threat. Middleton et al. 4759, Kanchanaburi, Khao Laem National Park (E); Middleton et al. 4642, Trat, Khlong Kaew National Park (E); Middleton et al. 4349 & 5548, Surat Thani, Khlong Phanom National Park (E).